Meanwhile, prepare the sauce. Put a medium saucepan on medium heat. Add a tablespoon of vegetable oil and heat this up. Add 2 cloves of chopped garlic, 2 shallots or 1 small red onion, 1 tablespoon of minced fresh ginger, some pickled soybean or soy sauce. After 2-3 minutes, add 1 tablespoon of ground turmeric, some tamarind paste diluted in warm water, some white pepper and about 1 cup of chicken stock. Stir and blend well. Take off the heat and add some sliced green or red pepper, wansoy (coriander) and woodear mushrooms if you like them. 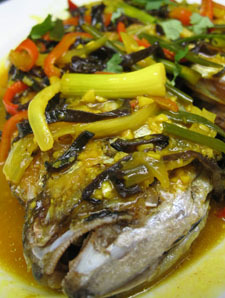 Pour the sauce over the cooked fish and serve hot with lots of steamed rice. There should be a healthy balance between the sweetness, sourness and saltiness of the sauce. Delicious! hi MM, Thai Cooking Class by Somi Anuntra Miller/Patricia Lake is also a favourite in my collection, my copy is dogeared, smeared with all sorts of curry pastes and condiments and in a fit of attention seeking, my cat has used the rib of the book as a scratching post – its hanging by a thread but i still use it a whole lot! aridelros, it isn’t as sweet as say the pinoy version of sweet and sour and yes, the tamarind paste helps though it is generally used sparingly. There aren’t too many local cookbooks besides the “classics” like Enriqueta David-Perez Filipino recipes or other similar books. National Book Store and Fully Booked a good place to start looking. i like to try the recipe, but “tamarind paste” is not available in Zamboanga City. Is there a substitution for it? Lling Lling, get very ripe sampaloc, remove the seeds and the hard pulp and stringy fibers and mash until you have a soft tamarind paste…that should do as a substitute.